If you did not find the drawing or 3d model you are interested in, contact support. Our specialists will try to help you. To contact support, click on this message. The drawing is presented in vector and raster formats ai, bmp, cdr, cdw, dwg, dxf, eps, gif, jpg, pdf, png, psd, pxr, svg, tif. This file can be used for making models in 3D modeling programs, large-scale models of copies, making layouts. The drawing is opened and edited by such programs as Adobe Illustrator, Corel Draw, Compass, AutoCAD, Photoshop. 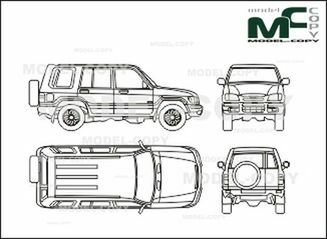 DRAWINGS OF CARS AND TRUCKS, BUSES, OFF-ROAD VEHICLES OF THE JAPANESE AUTOMAKER ISUZU.